After many requests from our previous years' guests for a 14 day holiday that combines a week on the yacht cruising around the islands and a week on land-based accommodation, we created the 'Yacht & Hotel' scheme. Your week onboard S/Y 'Alexandros' can be either on a 'Share a Yacht' or a 'Whole Yacht' cruise, starting and finishing at Lefkas town and taking you around most of the Ionian Islands. Just like it has been for years! The land-based accommodation will be at the seaside village of Nydri, which is situated on the east coast of the island of Lefkas, 20 kilometers south of Lefkas town. From Lefkas town where your cruise starts and finishes, it is only a 20 minute drive, from Preveza airport it is around 45 minutes and as always, all transfers are included in the cost of your holiday. 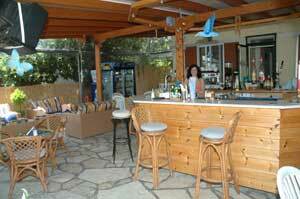 There are lots of options for accommodation, but we have chosen a small family hotel just outside the village, about 2 minutes walk from the center and all the shops, tavernas, cafes and bars. 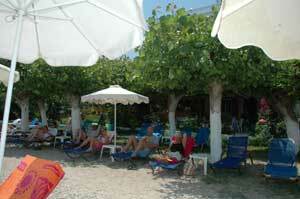 The Greek family that owns and runs it, is very friendly and they provide a relaxed and easygoing atmosphere. Of course the location was chosen carefully as well, with the hotel being right next to the beach with a view towards the little islands of Scorpios and Scorpidi (both owned by Aristotle Onasis family), Madhouri and one more uninhabited little island. All the rooms are en-suite with air-conditioning, small fridge, a safe box, satellite TV and a choice of a double bed or two singles. The hotel bar is by the sea, breakfast is included in the price and there is also internet access for those who need to keep in touch. Of course there is no swimming pool as the beach is only a few steps from your room. We should say here that the little hotel was recommended to us initially by some of our guests a few years ago, and since then we have been using it for those who would like to combine a week on our yacht with a week on a seaside village. The feedback has always been excellent, and the typical comments are that they really enjoyed the relaxed welcoming atmosphere, in contrast to the impersonal treatment of other bigger establishments. 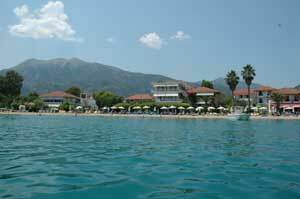 One of the oldest villages on the island of Lefkas, it is situated in an area of great scenery. 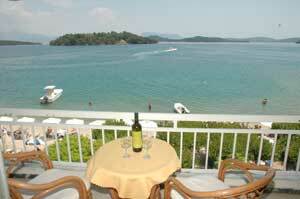 It is actually on a narrow strip of land between the high mountains and the sea, offering breathtaking views. When Aristotle Onasis bought the island of Scorpios which is only a few minutes boat ride from Nydri, he used to visit the little village quite often. Today it has become a water sports heaven and a seaside resort with plenty of options for daytime activities as well as entertainment for the night. 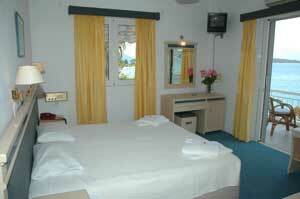 It is however a family resort rather than a young people's clubbing destination. You can rent pedalos, little dinghies, canoes, windsurfers and small motorboats (in order to visit the nearby islands). 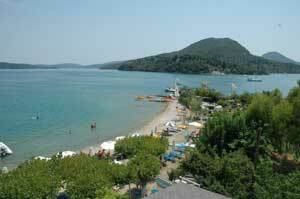 You can also water-ski, paraglide towed behind a fast boat or go scuba diving. The less energetic could take a day trip boat and spend a few hours visiting some pretty villages, or just sunbathe on the beach with a cold drink in their hands. There is also a path on the mountain for those who like trekking, that leads to a small waterfall. 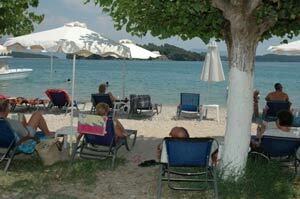 And of course, if you want to explore the whole island of Lefkas, you can hire bicycles, mopeds or a car. 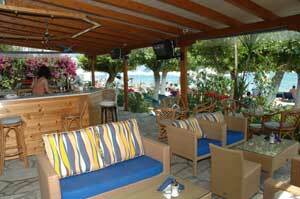 For the nighttime there are also plenty of tavernas, cafes and bars, as well as a couple of clubs. You have the option of a quiet night at a fish taverna by the beach, or dancing until the sun comes up the next morning (which usually keeps satisfied all ages in a family!). 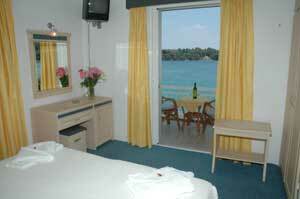 For the cost of our 2 week 'Yacht & Hotel' holiday, please visit our Rates page.